Manchester United seized the entirety of three points in their widely anticipated clash against Liverpool, as the match ended 2-1 in favour of the hosts at Old Trafford. Jurgen Klopp felt that familiar feeling, as he stood on the touchline watching his team bully the opposition in terms of possession, but going over the same thing again as the reverse fixture, realizing Jose Mourinho was doing his “thing”. 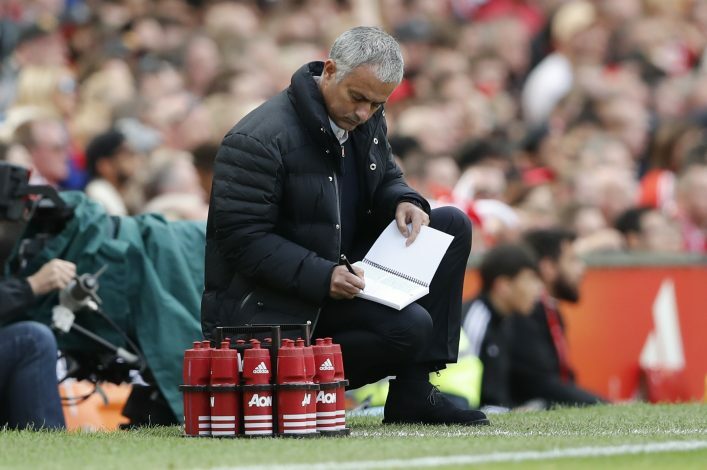 Nevertheless, as the substantial game progressed, Sky cameras, for a few moments, panned towards the Portuguese tactician while he was scribbling something down in his notepad on the touchline. Upon the passage of a few seconds, the prolific gaffer lifted the note to reveal a mass of scribbles, unaware of the camera pointed at him. People on social media have been excited ever since, trying to discern exactly what was written in the small piece of the record. Many suggested that the notes must have been about Marcus Rashford, owing to the English international’s contributions in the game. The 20-year-old scored two strikes, which weren’t really the only goals his side netted, as Eric Bailly registered an own goal in the latter half.